As one year ends and another begins, many workplaces like to reflect on the previous year and to celebrate their team and its achievements. At Aercoustics, we celebrate failures. Yes, you read that right. The biggest screw ups of the year are recognized with a trophy at our holiday party. This award is not meant to be negative. It is all in good fun and there is no shame in taking home the hardware. We do this to celebrate innovative ideas and learning. Our team works very hard and we want to reassure everyone that mistakes are part of the learning process. This speaks to our values as a company. At Aercoustics, what sets us apart is our passion for Outrageous Engineering. In order to deliver, we need to have outrageous ideas and sometimes those ideas don’t work the first time around. Sometimes these mistakes come from the innovation drive which fails and sometimes it is just human error in our quest to get the job done. As entrepreneurs we know that innovation needs some failure and we wanted to make sure our team realizes the value of making a few mistakes along the way. The “Timtohy Award” has its own story. The award’s name is based on a mistake that had a big impact on our business partner, Timothy Preager. When Tim received his P.Eng, the official certificate said Timtohy Preager. In the process of trying to correct this, he learned that the government had inputted his name incorrectly into the computer resulting in the typo. 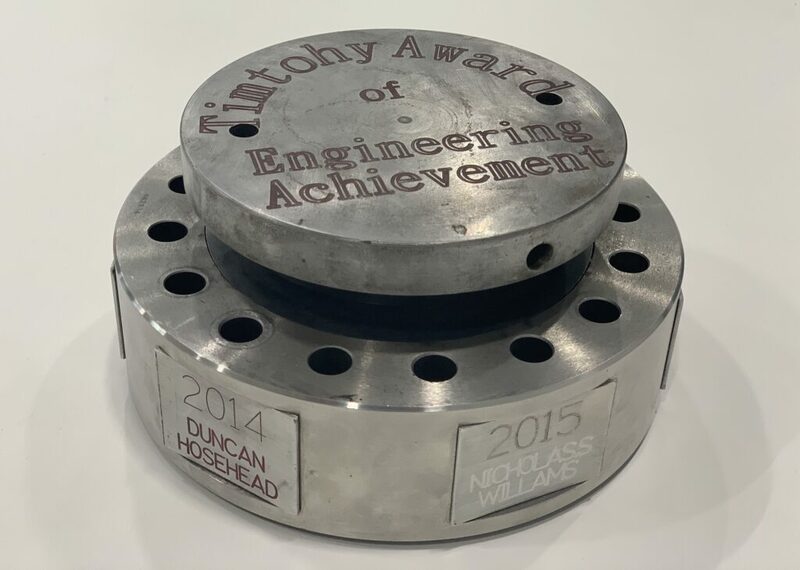 While not an engineering failure, we thought the award name reflected the errors that happen every day in all industries. The trophy is a broken sensor from one of our failures when we were conducting some innovative transit testing. We sourced a sensor to measure force from dropped weights. It wasn’t until we started the testing that we realized something was wrong, and we essentially destroyed this sensor—a $5,000 piece of equipment. While this was initially a failure, we learned from it and kept going back to the drawing table until we got it right. This sensor testing methodology was originally developed specifically for transit applications but we were able to use this technique for a number of different applications to predict the noise and vibration from a variety of sources into buildings. So it seems quite fitting that we use this broken sensor as a trophy because it is a good reminder that success comes from failures. Some of the nominations have ranged from fixing the mess caused by tangling 1,000 ft. of cables on a wind turbine to blowing up an onboard circuit board three times due to electrical surges because it was unknowingly connected to the subway train signal rail at 120 volts. We solicit nominations from the entire team and then everyone votes on the short list of nominees to choose what we believe is the greatest failure of the year. We are pleased to have a number of nominations every year so there is no shortage of mistakes and the learning that comes with it. It also provides an opportunity for the team to have a laugh and reminisce over these mistakes and epic fails. It is with a great sense of pride to see our team comfortable sharing our failures and celebrating them. Because as many great leaders have come to learn, we only truly fail when we give up trying. Internships are about more than getting coffee Marketing isn’t just for the giants Is that an Earthquake or Just the Streetcar?